NGames, a leading online games publisher, has today revealed details of the feature filled 5.1 Update coming soon to popular free-to-play MMO, DDTank. 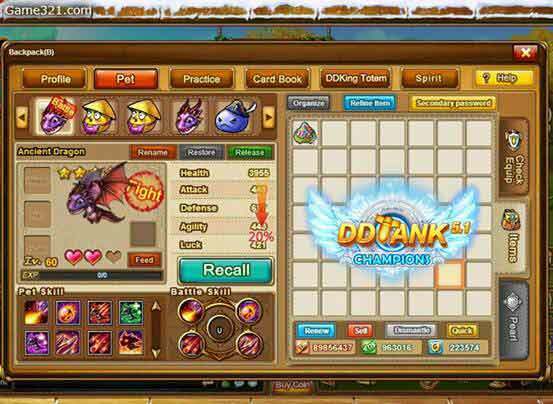 DDTank is available now on the Game321.com games portal, giving players an adventure packed with superb special effects, breathtaking BOSS raids, PvP competitions, and thousands of character customisation options, from hats, eyes, and clothes, to facial expressions. The anticipated Update 5.1 is packed with new features for DDTank players to explore, including all-new weekly Guild Battles, tricky Treasure Hunts, and tons of new pet equipment. The all-new Guild Battles start every Saturday 20:00 – 21:30, and will feature the top 8 guilds from the weekly Wealth Ranking league. Guilds compete against each other in a knockout style tournament to earn Battle Points. Victorious guilds can then go on to compete in further battles in a bid to net bonus Battle Points until their streak ends. After all Guild Battles comes to a close, the guild with the most points will be rewarded with bags of valuable rewards. Runner-up guilds will also receive awards based on their participation. Lucky adventurers successful in Guild Battles might also be rewarded with the Amethyst gem. Using this new Amethyst with necklaces creates a refined amulet that gives players a huge bonus HP reward. There are a massive 12 levels of refinement on offer with this new necklace too, so get battling! Update 5.1 lets DDTank adventurers bring their pets to life with brand new weapons, hats and clothes. Not only do they look awesome, but each piece of equipment improves a characters main attributes! Pet equipment can be redeemed by using new Beast Gems at the Game Store; or if players are lucky enough, they might get a piece of equipment by completing a high level Treasure Map. Upon reaching level 25+, players will now receive a rare treasure map that leads to a reward of Beast Gems and more. To complete the Treasure Map, players must navigate complex puzzles and events. Maps vary in difficulty; dependent on the amount of stars the map is rated. The more stars the map, the shinier the rewards in the treasure chest at the end. After completing the first Treasure Map, players can continue to solve more - up to a maximum of three per day. Remember: X marks the spot! Totems, Totems, Totems – and Cards! The all-new Totem Amulet introduced with Update 5.1 is a must have. Not only does it boost a base attribute, it also offsets coin usage by up to 60%. 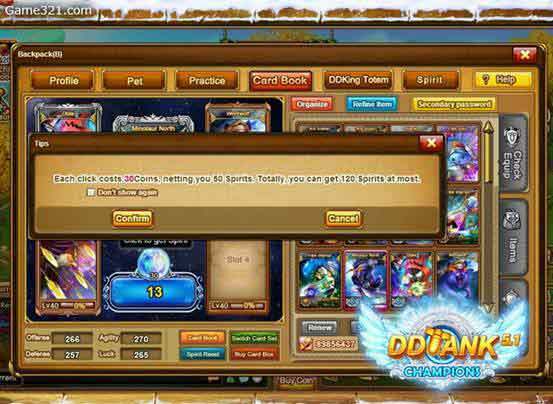 Players can also buy new Card Spirits, which give a chance to win more Active Points. The chance of receiving rewards from Silver and Gold cards has also been raised, and NGames is introducing a brand-new Platinum card that can net players mega rewards. 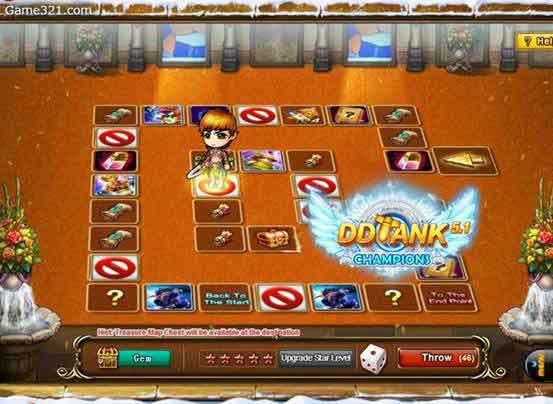 DDTank is a popular, thrilling free-to-play game available under the Game321 portal. "DD Tank" is a cute multiplayer on-line casual browser game.There is no need to download, just login and play. DD Tank attracts male and female players alike, its gorgeous graphics, cute and dreamy scenery, various fashionable suits, superb special effects and skillful contest systems appealing to players of all ages and gender. DD Tank was the first Q-version casual browser game that didn't require a download. The game is packed with superb special effects, breathtaking BOSS raids and PvP competitions, relaxing music and sound effects and thousands of character customisation options, from hats, eyes, and clothes, to facial expressions.